I've slipped back into that bad habit of watching the news on television and reading the news on line. Unfortunately, the news has been more than a little distressing. The big stories right now are the crazy Islamic terrorists who are into beheading folks who aren't sufficiently Islamic for them and (closer to home) the news out of Ferguson, Missouri of a police shooting of a young black man who turned out to be unarmed. It was another case of "Walking While Black." The latter story really depressed me. 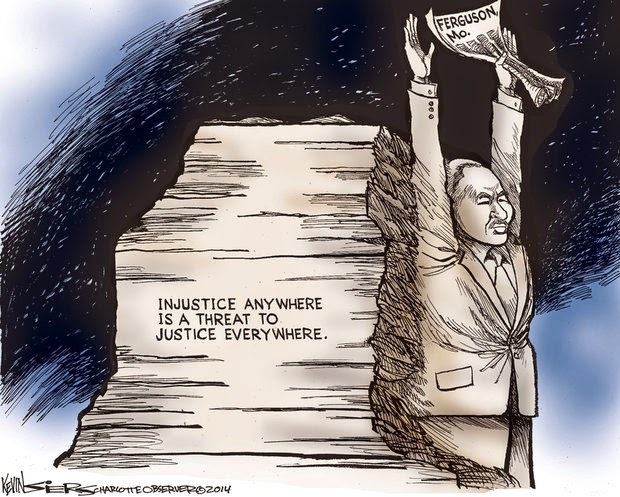 Here we are in the 21st Century and this nation just can't get past its racism. 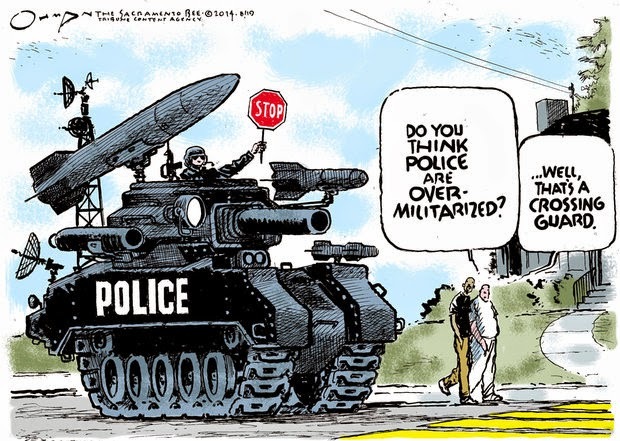 What makes it even worse is that the police are armed to the teeth with military grade weapons. The excuse is that the "bad guys" have them, so the police should too. Or something. The victim in Missouri was shot six times by the automatic weapon the officer was carrying. Why do police departments have to have tanks, or armed drones, or even the kind of automatic weapons that can fire off six rounds in quick succession. Wouldn't one shot by a trained officer be enough to bring "the bad guy" down? Are our police lousy marksmen? What? Wouldn't wearing protective body armor be a better choice if a military arsenal is involved? I know: too many questions from a loony old broad. It's just that I'd hoped to see some good kind of changes before I died. I guess I'm asking for too much. 2) the Los Angeles bank heist shootout, where the cops had pistols and the robbers had machine guns and body armor. the cops had to stop at gun stores nearby to borrow rifles (non machine guns) to fight back. But i don't think either of those things should require ordinary, every day patrol officers to commonly require those things. Sure, SWAT should have that stuff, for the rare, uncommon cases, much like how only special units in the UK are armed at all. In rural areas, it might not be practical (or possible) to have SWAT, of if they do, they might be so far away as to be useless, so in those areas i could see the patrol car having a rifle. But again, not a fully automatic machine gun. But again, the officer did not shoot him with an "automatic weapon", he shot him with a standard issue pistol, did he not? this is not a crazy weapon, it was the thing in every police officer's belt in the country. One shot by a trained officer? 3) a single round from a pistol isn't going to stop everyone. people survive shootings every day. 4) police aren't marksmen, they are officers who have very little requirements for marksmanship. It isn't their job to shoot people, so they don't really practice aside from the minimal required to qualify.